Schneider National became the latest carrier to announce that it has benefitted financially from the strong pricing and capacity squeeze when it announced its second-quarter operating revenues were up 15% year-over-year. 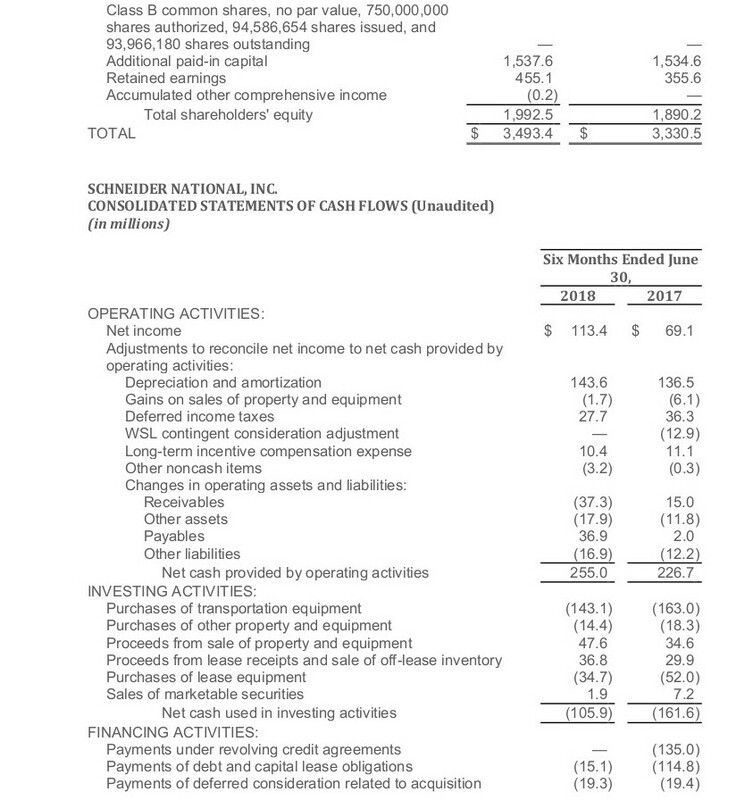 Schneider (NYSE: SNDR) beat street estimates with its earnings, posting across the board segment growth on operating revenues of $1.2 billion. Revenues, excluding fuel charges, increased 12% to $1.1 billion and net income was up 42% to $65.8 million. Schneider announced diluted earnings per share of 37 cents, compared to second quarter 2017 of 27 cents and adjusted diluted earnings per share of 40 cents, compared to second quarter 2017 of 23 cents. That beat Morgan Stanley estimates of 37 cents. “Our disciplined approach to pricing and dynamic freight selection, based on market conditions, will remain critical to successfully navigate in the robust market we see ahead,” explained Chris Lofgren, CEO. Lofgren raised the company’s guidance for the full year based on the expected strength in the supply-demand balance for freight for the remainder of 2018 coupled with strong performances expected from its intermodal and logistics segments going forward. 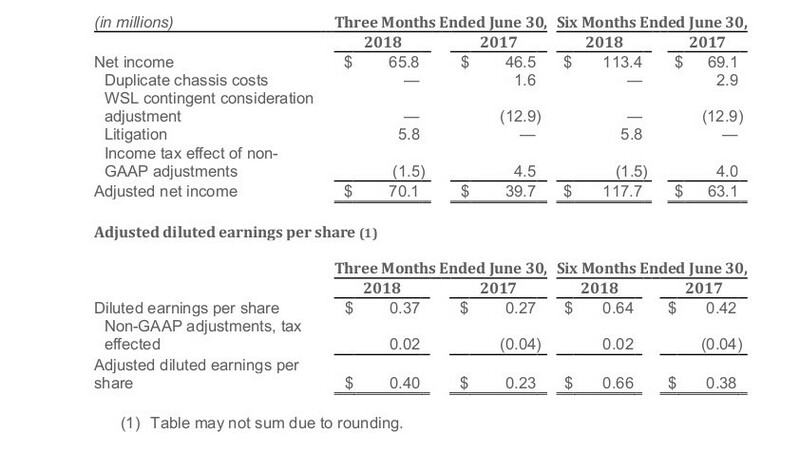 Schneider is forecasting full year 2018 adjusted diluted earnings per share guidance to $1.45 - $1.55. “Our deployment of capital will be to the segments with the best return profiles given market conditions, recognizing the tight driver market,” he said. “We will continue to be flexible and well positioned to invest in new opportunities in the more driver-friendly dedicated and intermodal businesses. Capital expenditures for the year are still forecast in the $325 million to $375 million range, Lofgren noted. Lofgren specifically cited the company’s Quest technology platform for driving enhanced margins through improved driver and asset productivity. Enterprise income from operations increased 16%, rising to $91.7 million in Q2 2018, driven primarily by price increases. Adjusted income from operations for the second quarter of 2018 was $97.5 million, an increase of $29.8 million, or 44%, compared to the same quarter in 2017. Net income for the second quarter of 2018 was $65.8 million, an increase of $19.3 million, or 42%, compared to the same quarter in 2017. Adjusted net income for the second quarter of 2018 was $70.1 million, an increase of $30.4 million, or 77%, compared to the same quarter in 2017. New CFO Stephen Bruffett said that purchased transportation was up 25% over 2017 and salaries and benefits increased 3%. “This reflects the timing of driver pay increases that were more significant in 2017,” he said. In the Truckload division, Schneider posted revenues (excluding fuel surcharges) of $568.7 million, up 5% over Q2 2017, and income from operations of $62.3 million, a 17% increase. The division’s operating ratio was 89.1% for the quarter. Revenue per truck per week increased 7%, up $239 to $3,847 year-over-year and 5% (up $167) compared to the first quarter of 2018. The growth was due to pricing increases, strong demand, and freight selection, Schneider said. Dedicated standard and for-hire standard revenue per truck per week grew 13% and 11%, respectively, compared to the second quarter of 2017. A restructuring of the company’s Dedicated operations played a role in a decrease in the number of trucks in the segment, with Schneider running an average of 260 fewer trucks in the second quarter 2018 compared to the first quarter. The company had 8,789 trucks in the quarter. Income in the division was partially offset by higher driver and purchased transportation costs and lower gains on equipment sales. Schneider posted a $4 million second-quarter loss in its First to Final Mile (FTFM) segment, but the segment remains on pace to profitability, it said. Intermodal posted revenues (excluding fuel surcharge) of $227.9 million, up 17% year-over-year. Income from operations increased 175% to $30.8 million. Its operating ratio in the segment was 86.5%. Mark Rourke, COO, said the ratio was a record for the segment. Lofgren said the segment benefited from more customers switching to intermodal from over-the-road due to the driver shortage, and the introduction of 1,500 additional containers and corresponding chassis in the quarter and 76 more tractor units from the first quarter that boosted capacity. Rourke added that the segment now has over 20,000 containers with plans to add an additional 2,000 to 2,500 containers in the third quarter. Revenue per order in the group increased 10% due to price appreciation, he added. Logistics division revenues climbed 30% to $249.7 million (excluding fuel charges) and income jumped 57% to $10.2 million. 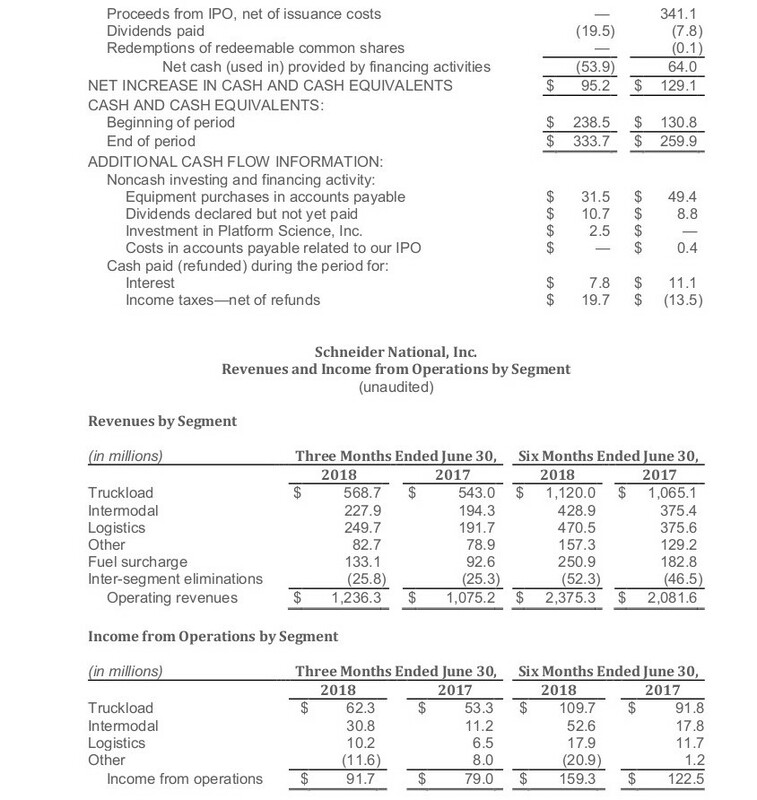 The growth, Schneider noted, was due mainly to brokerage volume growth of 19% and improved pricing. Brokerage was 79% of Logistics revenues in Q2 2018 compared to 73% in Q2 2017. Its operating ratio was 95.9% in the quarter.